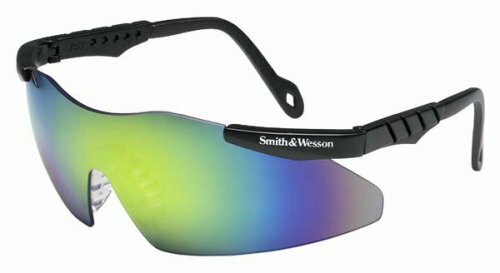 The Magnum Series safety glasses are ergonomically dimensioned for a 3 point fit, the ultimate in comfort. This pair comes in a Black Frame with Gold Metallic Mirror Lens. Perfect for the work place, shooting range or outdoors. Exceeds ANSI Z87.1 Industrial Standards for safety glasses and provides maximum UV protection. New improved fit ergonomic nose pad with self-adjusting rubber fingers Elimination of retention screws with new mechanical snap fit of lens to frame. Built in hinge stops to virtually eliminate scratching of lens interior.